Thinking Out Loud In Sturbridge: "Bueller? Bueller? Bueller?" Hi. I heard the same comment, loud and clear! Have you noticed that the latest BOS meeting wasn't even televised? Not yet anyway, and today is Friday. I did read that they (3 selectmen) are determined to get those bricks for the sidewalks, one way or another - using chapter 90 funds, community preservation funds, or a combination of the two, if they can get them. And, oh yeah, the price is higher than we had been told earlier. I think I heard that today, Sept. 19 is the last day to make their decision. Imagine that! We don't even know how they plan on using our money - and how it will benefit us in anyway, except that they intend to use money that came from our wallets. Now back to Haynes Street. I guess we have to listen to the curbstones speak for themselves. Correction: I meant to say that my understanding is that, today, Sept. 10th is the last day to make their decision! I heard the curbstones at at the Haynes St. and 131 intersection sobbing, and their curbstone brothers across the street yelling, "Ouch!" the last time I drove by. Perhaps their salty tears will help to melt the ice in that area a couple months from now - unless they are moved to a safer place, that is. 'Poor things need some TLC. 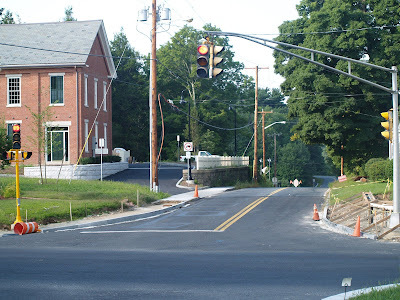 Do you suppose the selectmen think that someone already fixed the problem??? Maybe they are just taking a prolonged "time out." No, that can't be right, because, as of Monday, they were still hunting for bricks. Perhaps the BOS have kinks in their necks from too much brick hunting and can't turn to look at the intersection - and can only hear one frequency - their own. There are have not been any selectmens minutes online since July. Vacation? We're waiting....(tap,tap,tap) and growing a little impatient. Maybe they're thinking that the town could charge admission to the demolition derby at Haynes and Main, with popcorn, and seating on the grass at the library. Tickets may be pricey. I hear they're looking for a couple hundred thousand dollars. never mind waiting for bos broadcasts... i haven't seen a conservation commission meeting since last march. who is in charge of running these meetings on local access? and how does the ordinary citizen get to view past meetings? fodder for your musings perhaps? My understanding is that the BOS meetings were not to be held at the town hall until it was set up to televise the meeting. Lately we noticed that though the meetings were held on Mondays, we might not get to see them until Thursday. The last meeting must have taken place on Tuesday because of the holiday, but today is Saturday and I just checked channel 12. Nope. Nothing yet. We know there was a meeting because we read newspaper articles about the search this past week for brick money. COUGH. COUGH. Oh, excuse me. In the mean time I hope there are no traffic mishaps up at the dangerous intersection at the town hall and center office building. We've seen some interesting and difficult maneuvering in that area lately. We just went up and checked on the curbstone brothers at Haynes, Maple, and 131. Some of them have been knocked out of place (more than once, lots more) and several have black streaks and marks from being run over and/or sideswiped. One has a clear set of tire marks on his head. How long must they take this abuse? COUGH, COUGH, COUGH. Excuse me again. Rattling this cage and banging on the little bars on my door with my tin cup takes a lot out of me. What? This isn't solitary confinement? Oh, what a nightmare that was! But why can't anyone hear me? HEY,YOU GUYS! WHERE ARE YOU??? Anyone who is interested in the brick sidewalk saga, CPC is having a meeting on this issue Monday. I say don't have sidewalks on Haynes Street and on 131 in front of the town hall, and don't have them turning the corners on to Maple Steer either. If they can't redo it and make it right, undo it and put it back to what we had. Then fix the problem we had there in the first place! That's as much "Thinking Out Loud in Sturbridge" as I can do at the moment, nicely anyway. Here we are. It's yet another Monday (Sept. 13) and... Oh, hold the phone! Last Tuesday's Selectmen's meeting (Sept. 7) just came on channel 12. Nope. Nothing about widening that intersection. 'Just watched the finally televised BOS meeting from Sept.7. It was like getting hit with a ton of bricks! I just watched the Sept. 7th BOS meeting. It sounded like the state suggested constructing the sidewalks at the intersection out of concrete. 'Must be because they know the vehicles will be using the sidewalks. Not good. Concrete sidewalks at the intersection are fine, it's the width of the intersection that needs to be changed to accommodate the turning radius of vehicles, and the only way to widen it is to nibble away into the front yard of the Center School. The house on the corner is historic, and cannot be touched. The town will drag its feet here since they would most likely need to move the memorial on the lawn of the Center School for a while to allow for construction. The state made the design plans available, and clear. The town reviewed them, and those that know roads, that particular intersection did not ask for changes. Were they asleep? Whatever the reason is, it is coming back to bite them now. I am waiting to hear something from the town regarding what will be done. Have they released anymore information in this regard? maybe no one's talking about it because there's nothing to talk about. fact is the intersection's been done exactly as the state planned it. seems like since they own 131 and used to own 15, they pretty much know what they're doing. 1) Intersection not planned adequately for type of vehicular traffic to be expected. 2) Past history of intersection showed that trucks used lawn/berm to enhance turning radius that was not there otherwise. 3)Town officials familiar with intersection did not review plans adequately with state knowing full well the history of intersection and need to correct its deficiencies. 4) The plans were allowed to go forward and now the problem has been perpetuated. 5) The intersection needs correction. Each day shows more damage to curbs. I'm sorry, who knew what they were doing? Time for more talking is done. Time to act, and fix the issue is now. Anonymous says, regarding the intersection, there’s nothing to talk about. That’s what I’ve been expecting we would hear from Town Hall. I’ve read and heard this kind of reasoning before, in the past, in anonymous responses on this blog and in local papers – and, even way before this blog started, many years ago learned that there is an element in this town that sets their minds on something and hangs on like junk yard dogs, or badgers. Right or proven wrong, they are determined to get their way. At last week’s BOS meeting one or more of our selectmen said that it didn’t matter that they didn’t know where they would get additional money for bricks, as they didn’t know where other money would come for cost overages and unforeseen problems generated from the original plans either. So are they in effect telling me that if I need to do costly repairs in my home, and don’t know how I’m going to pay for them , I should go ahead and put in skylights and a Jacuzzi at the same time? Exuse me! Are these the the reasonings of thoughtful adults? There IS a problem at the Haynes Street, 131, Maple Street intersection. All you have to do is be there to experience it for yourself. Last week’s BOS meeting was quite telling, and 3 members (the majority) came off as uncaring, unhearing, and with questionable thinking. For instance, we heard that if we didn’t put in brick sidewalks now, ten years from now we would be wondering why we hadn’t done it when we had the chance. Big Whoop! Excuse me, again. We have a dangerous intersection at Haynes Street, Maple Street and 131. What about that? Any minute of any day we could be grief stricken because we haven’t done something about that. Well from what I hear nothing will be done at the Haynes Street intersection, oh a stop sign might be moved back but that's about it. Its been said that to change that intersection would cost upward of over 2 million dollars!!!!! As far as the brick sidewalks, its a done deal, either the state will cough up the $189.000 (don't hold your breath) or it will come from Chaper 70 or CPC funds. Like it or not, it is what it is. They could at least remove the some of those sidewalks for a lot less than two million dollars. Then at least things would be a little less hemmed in at that intersection. I have no idea what you mean by Chapter 70 funds. I do know they thought they might use some of the Chapter 90 funds, which should be used for important road work, not for extras like bricks rather than concrete. As for the Community Preservation funds, they charge us an extra 3% on our property taxes to get that money and I'm tired of having it spent on all these extra things that we don't need. There are so many ways that money could be spent on things we do need. Why are we putting so much into these "budget envelopes" just to find that millions have been spent for land purchases and all sorts of other things, only to have someone try to scare us off by telling us that it will cost $2 million to fix that intersection? Number one: I would ask where "Anonymous" got that figure, and, number 2: What the H. E. double L are we paying taxes for? Pretty Little Things???? Anonymous, you say, it is what it is. What does that mean? Are you saying that we should just forget about it? What on earth is important in this town? Bricks? Slate? Copper? Olympic sized swimming pools? Buying up all the land we can get out hands on? WHAT? It is what it is, we're getting brick sidewalks, the Selectmen have decided, their final decision deadline was September 10th. If the State doesn't come up with the money it will be taken out of either CPC funds or Chapter 90 funds (sorry I misspoke when I said Chapter 70). If we vote no for CPC funds then the BOS can use Chapter 90 funds without approval from the voters. I feel that the brick sidewalks are being pushed down our throats. I couldn't agree more with the statement "what the he.. are we paying taxes for". I detest thinking that we just forget about the brick sidewalks but as far as the BOS, they say its a done deal! If the State doesn't pay (still our money) than we will pay locally. As far as the intersection, I suggest you call the Town Adminstrator or Chair of the BOS and get the details on the infamous intersection, I think you'll be amazed. Anonymous, what amazes me about "the infamous intersection" is that we have a problem there now. It needs to be fixed now. We've spent money on everything but. And nothing is being done about it. It wouldn't matter what may or may not have been found on paper someplace, or what may be beneath the pavement. Something needs to be done, even if the best they can do is to remove sidewalks in that area. Anonymous wrote: "As far as the intersection, I suggest you call the Town Adminstrator or Chair of the BOS and get the details on the infamous intersection, I think you'll be amazed." Anonymous, what do you know that we don't know? I just watched the B.O.S. meeting. Everyone in the town of Sturbridge should be scared to death! We will be allowed to speak our minds at a meeting because it's better than an e-mail but it really doesn't mean much because the B.O.S will decide the best way to spend our money beause we won't always agree with them and they know better than us. Spending an extra $189,000 is insignificant because if they don't know how to pay for cost over runs or other unforeseen problems what's a few bricks going to hurt? It's not God bless us but God help us! To the person who wrote, "I just watched the B.O.S. meeting. Everyone in the town of Sturbridge should be scared to death!" The dismissive attitude of some of the selectmen is insulting and hurtful. A doctor who went to the BOS and stated he is now disabled and cannot navigate bricks with either his cane or a walker was told that this brick sidewalk is considered by the American with Disabilities Act to be wheelchair compliant. The doctor explained that, in his case, he wasn't concerned about a bumpy wheelchair ride, as he does not use a wheelchair. Where there any sounds of compassion? None that I heard. Dismissed. Another spoke of the extra cost, while not being a burden to himself, may very well be a burden to another. The response amounted to saying, "$37 is insignificant." (Is it insignificant if that's a week's worth of groceries for a low income person? Medication? Getting snow shoveled and ice cleared for the elderly?) The cost argument, as were others, was also dismissed. About one or 2 minutes were given to the Hayne's Street intersection, and guess what? That subject was also treated as only a brick problem - whether they should use them at that location also. I wish they would just put on their big boy and big girl pants and stop with this: "I want what I want and I want it now." Who put the kids in charge? We need what we need.